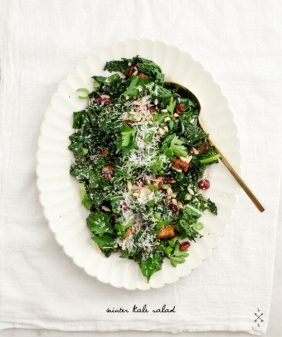 A delicious 30-minute salad for healthy weeknight dinners in fall or spring. Tossed with a bright Apple Cider and Honey Vinaigrette. Gluten free. This is my perfect weeknight salad. I like to start the week off on the lighter side… less bread, less starch. It often goes downhill from there… by Thursday it could be all cakes & cocktails, but come Monday it’s time to get it back together. Which still doesn’t mean eating bland food! 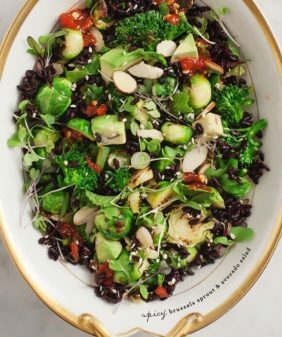 I love this salad for its balance of bright flavors and variety of textures: the salty ricotta salata, a pop of tartness from the dried cranberries, a meaty bite from the roasted broccoli, crunch from the pine nuts. It’s brought together with a simple sweet & mellow apple cider honey vinaigrette. Preheat the oven to 450 degrees. Place the broccoli florets on a baking sheet, drizzle with olive oil, and toss with a few pinches of salt and pepper. Roast in the oven until dark brown, around 20 minutes. 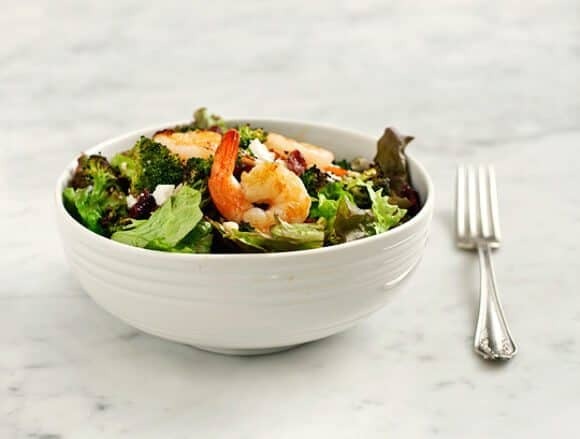 Make the dressing while you wait: In a small saucepan over low heat, heat the vinegar and honey until warm. Turn off the heat and whisk in the olive oil. Season with salt and pepper. Set aside. Toast the pine nuts in a small skillet over low heat for just a couple of minutes until golden brown. Set aside. 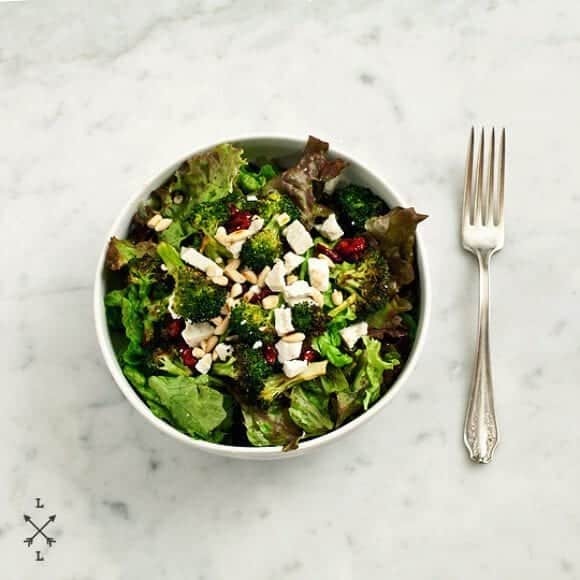 Assemble the salad with the lettuce, roasted broccoli, cranberries, ricotta, toasted pine nuts, and protein, if using. Toss salad with as much or little dressing as you like. Very healthy flavours indeed! 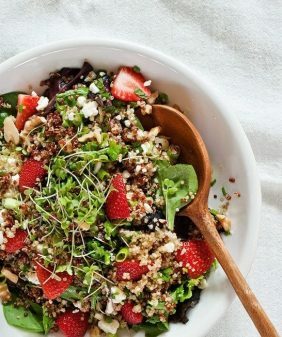 I love the gorgeous red of the cranberries peeking out of the salad. What a great combination! I’m especially intrigued by the honey vinaigrette–sounds perfect with the broccoli and nuts. What a great idea to add roasted broccoli. Yum! 🙂 This salad looks fantastic. Any salad with cranberries is guaranteed to be tasty. Great post! Beautiful salad! 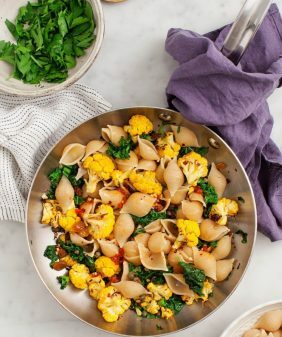 I love the roasted broccoli in there! 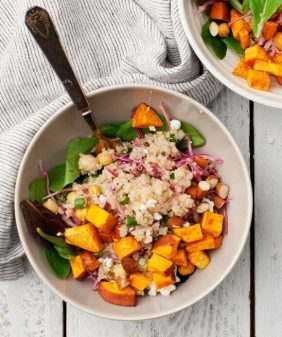 This is a very smart salad! I agree Monday is not just for eating bland food, this is a perfect example. What a beautiful salad! I adore ricotta salata and buy several wedges whenever I can find it. I will be giving this one a try! I made this salad last Friday night and my husband loved it so much he asked for it again Saturday AND Sunday for lunch. I didn’t have ricotta salata (one of my favourite cheeses, but I forgot to stop at the cheesemonger to pick it up) so I used parmigiano in its place. The salty bite was perfect, but next time I’ll remember the ricotta. And the vinaigrette – it’ll get many repeat performances at our table. YUMMY salad! Thank you! Had broccoli in my refridge, long day at work, so easy to put together. After tasting the dressing I decided to add a teaspoon of Dijon mustard. So tasty! Thank you for the recipe! This looks amazing! 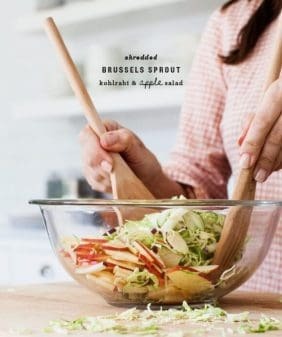 I always get similar salads to this when I go out, so glad I found a recipe for it. thank you for sharing! !